THE JUNGLE WARRIORS, is a true story of the courage and brotherhood of American soldiers. Follow Bobby Briscoe, a U.S. Army sharpshooter, through the humid forests of Vietnam and into the searing heat of battle. You too, will come to know why this highly revered brigade of African American soldiers was named…the Jungle Warriors! Suggested Castng: Chris Tucker, Nick Cannon, 50 Cent, Samuel L Jackson, Barry Pepper and The Rock. 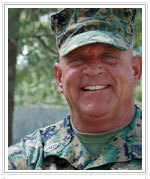 MATT SIGLOCH graduated with honors from Valley Forge Military Academy in 1972. One week after graduation Sigloch enlisted in the United States Marine Corps and reported to MCRD Parris Island, S.C. Thirteen weeks later he graduated as the "Honor Man" of his Platoon and Series, awarded the "American Spirit Honor Medal," and was Meritoriously promoted to Private First Class. Sigloch's Marine Corps career took him all over the world. A Combat Veteran of the Evacuation of Siagon, Beirut, Desert Shield, and Desert Storm, he also served as a Drill Instructor at 3rd Battalion, MCRD Parris Island, and the "Marine One" Crew Chief for President Reagan during his first term in the White House. During his final months in the Marine Corps, Matt was approached to work on the feature film "Demolition Man." He took two weeks leave to work on the project. Shortly thereafter he submitted his "Request for Retirement," and a new career began. He joined SAG in 1993, and in 1995 was cast as a Drill Instructor in the Pilot of JAG. Shortly thereafter, he became the Military Technical Advisor for all 10 Seasons of the JAG Series. To date Sigloch's list of Feature Film Credits range from, Oliver Stone’s "Pinkville," and "W," to "Batman Forever," and "True Lies." TV Credits from JAG to the new Pilot "Washington Field." Matt is the Lead Technical Advisor for such shows as "NCIS," (135 Episodes) "Criminal Minds," (86 Episodes) “Bones", "Chuck," etc.